Environment, Nature and Cultural Heritage. Curious Minds. Drug discovery in Dundee. 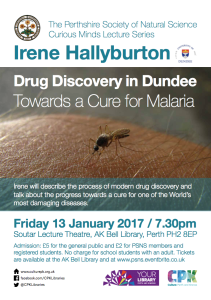 Irene Halliburton will talk about the process of drug discovery and progress towards a treatment for Malaria at the University of Dundee.